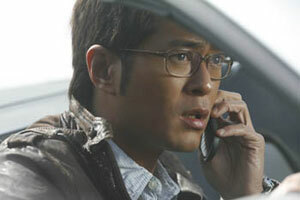 (left) Louis Koo gets a call from (right) Barbie Hsu in Connected. The Skinny: Unintentional laughs ahoy! Connected has thrills, spills and overacting aplenty, and qualifies as one of the most stupid and entertaining Hong Kong movies of the year. Obviously, checking your brain at the door is a must. This film was brought to you by Motorola, Tissot, Pepsi and Louis Koo's tanning salon. If Connected teaches us anything, it's probably this: Motorola phones rock. Connected is director Benny Chan's remake of the 2004 Hollywood thriller Cellular, about a kidnap victim who solicits help from a stranger through a random cell phone call. Chan swaps in Louis Koo and Barbie Hsu for Chris Evans and Kim Basinger, adds a romance subplot between the leads, gives facetime to Motorola phones and other sellable products, and dials the whole thing up to a ridiculous and entertaining eleven. The film's sentimentality feels perfunctory, and the acting is overdone with a capital "O", but the whole thing manages to work in spite of its own rampant stupidity. Connected isn't quality, but it's fun. Louis Koo stars as Bob, a mousy debt collector with a history of never fulfilling his promises or seeing things through. Bob's son Kit (Presley Tam) is going to Australia to be with his mother, and Bob promises to see him off at the airport. Kit is skeptical, however, and is obviously used to disappointment from his deadbeat dad. Sadly, disappointment appears to be in the offing once more; before Bob can make his way to the airport, he's distracted by a random phone call asking for help. On the other end is Grace Wong (Barbie Hsu of Meteor Garden fame), who claims to have been kidnapped by a mysterious black-wearing bad guy (Liu Ye) who threatens and kills with impunity. Grace is able to MacGuyver a working phone connection thanks to her kidnappers locking her in a tool shed with a smashed but still usable phone. After some aborted attempts, she reaches Bob, who at first doesn't believe Grace's claims of kidnapping. However, after hearing somebody get shot in front of Grace's horrified eyes, he gets on board with her story pretty damn quick. The speed with which Bob buys Grace's story is still a little too fast to be that believable. Regardless of the real terror going down on Grace's end, Bob seems like a gullible sap, and immediately begins to act irrational in his quest to aid this unknown person on the phone. Still, despite how outlandish the whole situation is, Bob proves to be a watchable and amusing hero, largely due to his everyman status and Louis Koo's pronounced overacting. Early on, Connected seems like your standard thriller fare with cardboard characters and routine situations, but once the first set piece arrives, the movie hits high-octane insanity, opting for white-knuckle excitement over logic, common sense or propriety. After Bob witnesses the bad guys kidnappping Grace's daughter, he gets into his economical mini-car and starts a silly and very entertaining car chase where he basically wreaks a trail of vehicular destruction all over Hong Kong while not doing a single useful thing to stop the bad guys. Bob causes car pile-ups, tears down scaffolding, dings multiple fenders and plows through a product-placement bonanza of Pepsi Max cans before picking up his undamaged Motorola phone and stealing someone else's car to continue the chase. Presumably this is all supposed to be thrilling, but the words "unintentional" and "funny" seem more appropriate. Connected goes from zero-to-sixty so quickly that alienation or guffaws are likely, especially since nobody in the cast can seem to dial down their performances. Barbie Hsu is so overwrought in her early scenes that she seems to be on the verge of a stroke, and Liu Ye runs the gamut from cartoonishly menacing to hilariously megalomaniacal during the course of the film's two hours. TVB fixture Wong Cho-Lam shows up in an pointedly comic cameo, and Eddie Cheung amps up the smarm as an annoying inspector. The film's lone "normal" performance belongs to Nick Cheung, who essays his veteran cop role with subtlety and nuance - at least, when compared to the histrionics displayed by his co-stars. Really, the acting in Connected is that overplayed. The signature performance, however, is Louis Koo's. The Tanned One gets the green light from Benny Chan and delivers an epic overacting performance for the ages, creating a near-hysterical character that's practically the human equivalent of Scrat, the acorn-hoarding rodent from those Ice Age movies. As Bob, Koo cries, shouts, pops his eyes, acts nervous and sweats like there's no tomorrow. It's all a bit much, but Koo's antics do up the entertainment factor considerably. Seeing the actor play down his suave ladykiller looks helps, too. There's also some character work at play here. Bob is your standard loser who manages to become a hero and earn the respect that he was previously denied. This is a screenwriting stock character that's as common as it is identifiable, but thanks to the extreme obstacles thrown at him, he earns sympathy. Bob's car is totaled, he almost loses his phone twice, plus everyone he runs into thinks he's a deranged criminal. One almost expects the filmmakers to throw killer bees or a mountain lion at the poor guy. When the beaten-up Bob finally takes charge of his situation, the moment is long-awaited and surprisingly rousing. Not that Connected mixes character and action exceptionally well. The film's commercial elements are cobbled together in an obvious and generic manner. The screenplay features hackneyed situations and canned emotions, and deals out implausibilities and clichés from the very first minute. The bad guys act laughably evil, plot holes abound and nobody acts in a convincing manner. Discerning audiences may judge Connected to be ill-conceived and pandering crap, and they would have every right to that opinion. This is transparent, manufactured moviemaking that should never be considered for any awards. Well, at least none of the artistic ones. Despite its lack of creativity or depth, Connected manages to entertain through technical prowess and sheer momentum, not to mention some excellent action sequences and stuntwork. Benny Chan and action director Lee Chung-Chi handle the physical portions of Connected so effectively that it raises the film from typical commercial tripe to entertaining commercial tripe. The film is a resolute product that succeeds at being the kind of frivolous entertainment that the masses usually enjoy. Presumably, that was what the filmmakers were aiming for, and Connected hits and even surpasses that mark handily. Connected is basically the Hong Kong equivalent of empty Hollywood spectacle, and entertains with its action while simultaneously amusing with its sheer stupidity. A fair comparison would be the work of Hollywood hitmaker Michael Bay; the Transformers director makes bad movies, but despite the bombastic scripts, cardboard characters, and canned platitudes he manages some kinetic, rousing entertainment. If aping the commercial excesses of a guy like Michael Bay was Benny Chan's goal, then congratulations: he succeeded. This is a dumb and even forgettable movie, but as a throwaway ride, it's worth the time spent. And it's thankfully not pretentious.